When money was tight but I was still eager to get our Omega 3 in, mackerel became the new salmon. Luckily, we all love mackerel in our house and this meal has saved my budget on so many occasions. Asparagus has been a more recent addition to the meal, I know it can be a bit pricey but you don’t need a lot in this recipe. You can pick up a small bunch of asparagus from Asda for £1. Bargain! 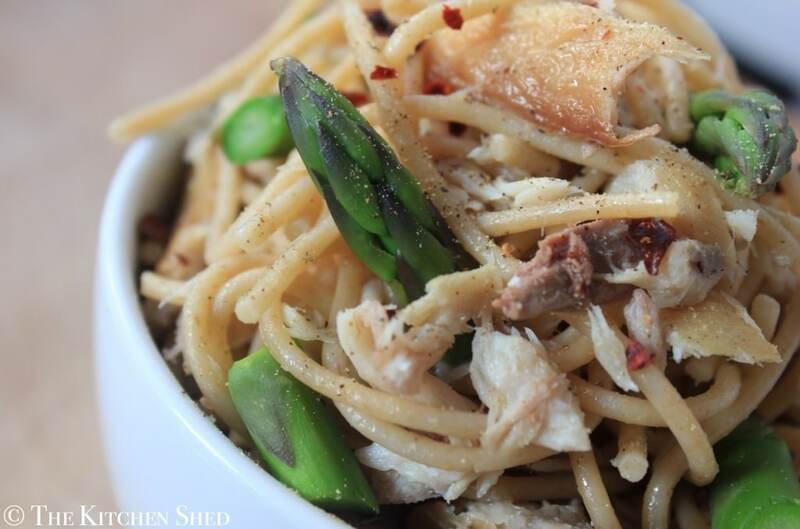 Clean Eating Mackerel and Asparagus Spaghetti is quick and simple to prepare and you can jazz it up to suit your own tastes by sprinkling on some dried chilli flakes or adding a squeeze of lemon juice. It tastes amazing with a side salad of spinach, rocket, tomatoes and red onion. 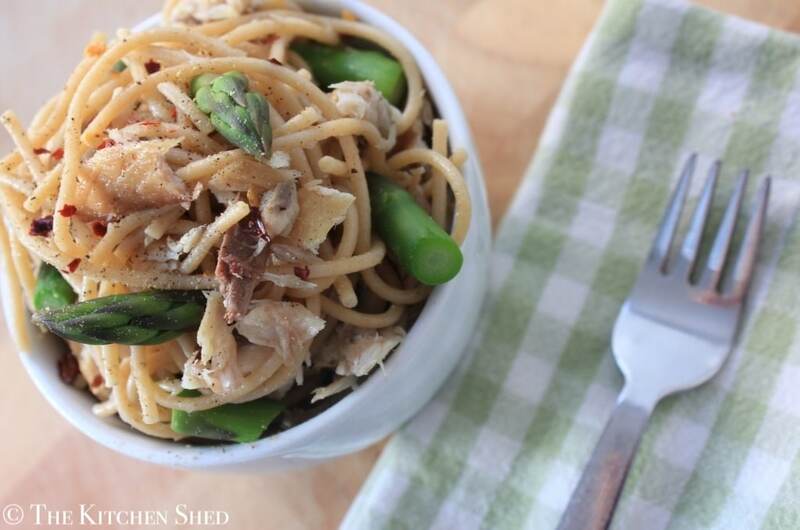 Clean Eating Mackerel and Asparagus Spaghetti is quick and simple to prepare and you can jazz it up to suit your own tastes by sprinkling on some dried chilli flakes or adding a squeeze of lemon juice. Cook your spaghetti in boiling water for appocimately 10 minutes, or until cooked to your personal preference. Drain the spaghetti in a colander and pour over the olive oil. Give the spaghetti and toss with two forks to spread the olive oil around evenly. Allow the spaghetti to cool down for about 20 minutes or so, tossing with the forks occasionally to release the hot steam. 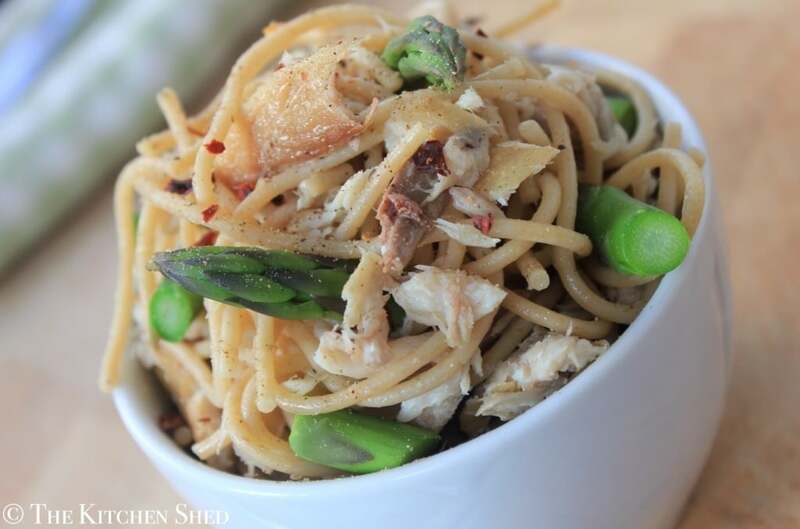 Whilst the spaghetti is cooling, steam some asparagus for 3 - 5 minutes, and flake up the mackerel, being careful to remove any skin and bones from the fish. Once the spaghetti is about room tempereature, add the mackerel and freshly ground black pepper and toss to combine. Slice up your asparagus and add it to the spaghetti and mackerel, alternatively, you can just serve it as a side along with a green salad. Top with lemon juice or dried chilli flakes if desired. Made this for tea tonight but used fresh mackerel fillets. Yummy. may I wish to suggest you few interesting issues or tips.